Material on this web site copyright © 1995-2015, TelePost, Inc. All rights reserved. I received the LP-100, and all I can say is Wow! What a great piece of gear – certainly worth waiting for. 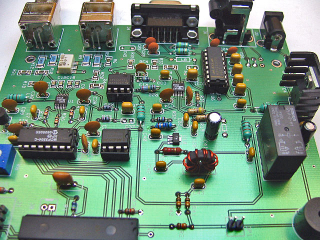 You have created a product that is quantum levels above any other watt meter. I am usually subdued in my enthusiasm for a new product. But this is WOW. I'm blown away! It is an absolutely awesome piece of equipment. And, the fact that you took the time to program my callsign into the screen-saver was a touch of class. The new LP-100 truly represents a new standard in wattmeter accuracy, performance, and useful features. I believe the LP-100 definitely sets a new standard for wattmeter functionality and usability. Thanks again for a fun project and quality product. I do very much want to complement you on the fantastic job you have done with the LP-100. The unit works beautifully, and I am delighted with it. Thank You! I love the LP-100. The return loss function is simply superior for adjusting an antenna tuner. Also, the LP-100 displays no variation in readings from a few watts to, say, a kilowatt as is so common with other wattmeters. The LP-100 is simply superb. Thanks for a great product! Sure matches with the equipment decor! I love it. I like my LP-100 more with each passing day. I am very impressed with the quality of the manual. It looks great when printed on a color Laser printer and is very easy to read and follow. The display really looks great...the black box is perfect, and really adds “class” to the look of the meter. Great quality for the board and components! I am delighted. A really great kit and experience, Larry. I am totally pleased with the result!! This is one of the best kits I ever built !!! also loaded the firmware update Super Job on this kit!! LP-100 OE Group Build - This is a link to 24 pictures from a group build session in Austria. This is a great idea for a club project. Here are comments from Holger, one of the organizers of the session, along with one of the pictures. Click on the link or picture for a slide show of the assembly and calibration. One week after our building session we met again. This time we met in our Clubstation OE9XRV (OE9R) to calibrate 11 (eleven!) LP-100. 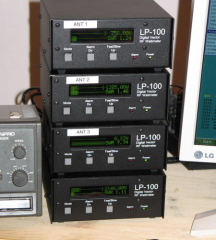 All LP-100 were in a range of 10% (before calibration). As reference we used a LP-100 ordered assembled and calibrated. And again, we had a lot of fun together. A special thanks to Claus OE9CWH for the tools and help! We will have a 2nd calibrating session to calibrate the last 5 LP-100 here in OE9. The LP-100 goes way beyond high accuracy with flexibility without compromise, stylish looks and ease of use. 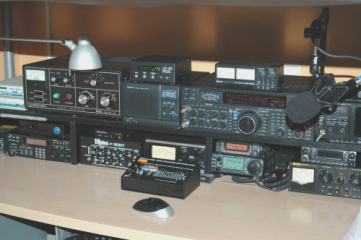 I have added new Pictures from our Contest-Station OE9R. We use 5 LP-100 to display our power and protect our amp from damage. I am delighted with the LP-100 and am pleased that it is taking off for you! This plotting facility is absolutely fantastic. I have never known such great software, I love the ability to be able to check out my ants! To use an American expression "it's awesome"! Thanks. Well it was fun while it lasted...but it's all built, calibrated and working. Kit arrived around 2:30pm on Friday, went straight to work on it. Finished build and initial check-out around 10pm (include Dinner, Potty, and libation breaks). This morning I spent an hour doing the calibration and final assembly. It's all up and running. BTW the sucker was very very close before alignment. Very minor adjustment for all bands and the phase slope was very close....I made a RG142 cable and put it on network analyzer and then used that for it and only had to step 2 digits down. Larry, I thought I would send these photos of my mobile installation. As you can see your LP-100 is at the center of it. It works great and was just what I was looking for. Thanks Larry. ...It has been a nice Xmas gift. Thanks for all, Larry and HNY to you and yours from me and the family. 73s! BTW: Sending you a couple of pics for your site. My LP-100 is fully functional and calibrated using your LP-200 dummy load. It's certainly more power information then I'll ever need! New version of 1.0.2 downloaded and flashed to LP-100 without any problem. Thanks for a great product! 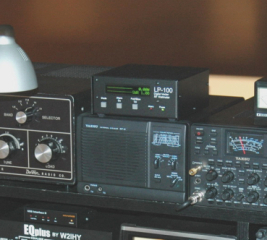 Also included is a photo of my new LP-100 sitting in a place of prominence in my HAM shack. Sure matches with the equipment decor! I love it. 6-15-2006... Hello Larry. Finished all the wiring tonight! It Works. Here is a picture of my finished LP-100 wattmeter. It works well, and now I plan to do the calibration needed using a good wattmeter and dummy load. Again Larry, thanks for making this wattmeter available to the ham population. By the way, the peak reading is just great! 73 and thanks again, one happy customer! ...Here are a couple of pictures of my operating position. The LP-100 is nestled in it's place beside the amp. A really great kit and experience, Larry. I learned some things in the process of assembling this kit. The peak detector in the manual was invaluable to me, as you well know by now. I was having a problem calibrating trying to use what I had on hand, instead of following your instructions. After beating my head against the wall over this, I finally built the detector and all went smooth from there. I can't wait for your next great project! 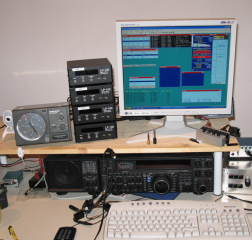 The present set up at W9OY. 2 SDR-1000's, an Orion, 4 amps and 2 tuners. 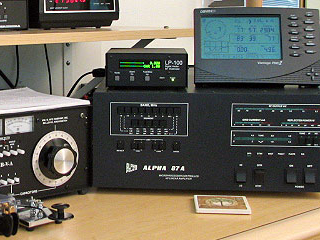 The LP-100 is on the table in the lower left corner under the antenna switch, and it is represented on the right computer screen using LP-100 VCP. The meter went together in 8 hours with no problems. The build was a very enjoyable experience. I have LP-100 VCP also working. My suggestion is to read through the manual at least twice before starting the build. Things that were not clear became clear as the build proceeded, and I was able to quickly refer to different parts of the manual since I was familiar with it. I used a 800 degree Weller and .15 silver bearing solder from Radio Shack for the build and it went together perfectly. I am totally pleased with the result!! I used the meter with my doublet and Johnson Matchbox and was able to minimize the SWR very nicely using the fast response at about 3/4 watt of forward power. Amazing! I think this is an acid test since the Johnson is known to be a "touchy" tuner. No other commercial digital meter has been able to pass this test. They all had too slow of a response. I wonder if the fast/slow toggle could be adapted to be a fast/fast, slow/slow fast/slow slow/fast toggle? Maybe you could indicate by slashing the W/w or adding a period or something when getting to the non identical choice. My general preference is Slow on Power and Fast on SWR or slow/fast. I set up the meter on a second antenna I have on another part of my property using the antenna to feed the XMTR port and a dummy load connected to the LOAD port of the meter. When I transmitted on the distant antenna I was able to read the field strength in dB on the LP-100 and it varied nicely with increase and decrease in power. So  I can measure accurate relative field strength with the thing as well. Thank you for a very nice meter. 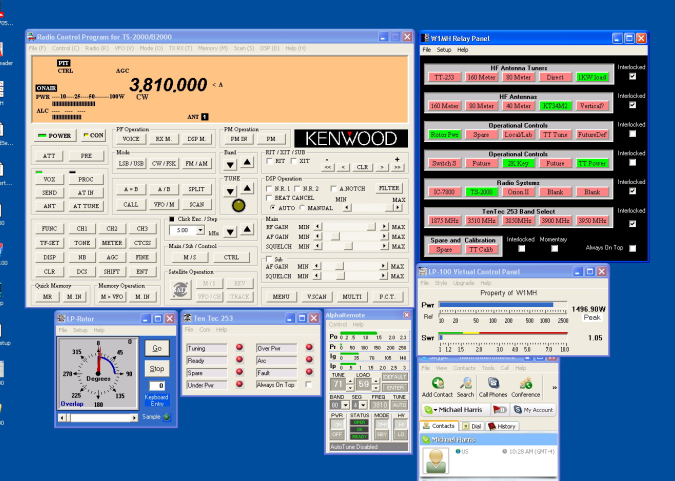 Below is a scaled down screen grab from W1MH's computer showing the software used to control his remote base station. The software used includes the Kenwood ARCP program for control of the TS-2000, the AlphaRemote software for control of his amplifier, the Skype audio program, and several of my programs including a custom relay control panel, LP-Rotor, LP-Status and the LP-100 VCP to control his new LP-100. Here are some pictures of my station. The LP-100 is in the middle of the rack next to the Ten Ten 253 Auto Tuner. Very reliable system and extremely easy to use. Love your new meter. Larry: I finished my LP-100 on 7/18/2006. Everything worked perfectly from the beginning with no (zero) turn-on problems. The LP-100 is a beautiful instrument with break-through features. You are to be complimented on its design, quality and documentation! Congratulations on a GREAT JOB and a fun construction project!! The calibration procedure went smoothly. I would have probably been happy with the default power settings but it was nice to tweek them "right on" for each band using my HP test equipment. I'm enjoying using the LP-100 on the air. 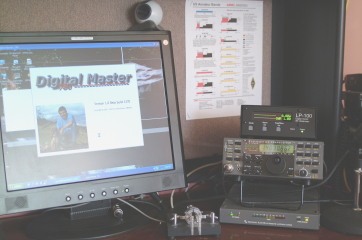 The peak-hold function lets me continually monitor my output power and VSWR while operating either SSB and CW. 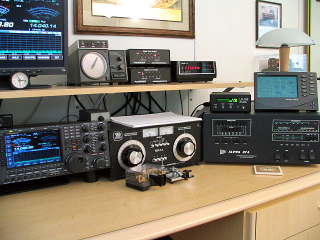 The wide power range gives accurate readings whether operating at high power or QRP levels. No need to change settings or slugs. The vector impedance capability will be extremely useful for my next antenna project. I believe the LP-100 definitely sets a new standard for wattmeter functionality and usability. A couple of pictures are attached. 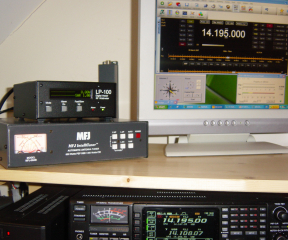 The first shows my set-up for calibrating the LP-100 using a Bird 200 Watt 30 dB attenuator and HP 8901A Analyzer. 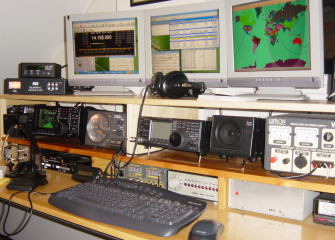 The second picture shows the LP-100 in operation in my shack. Thanks again for a fun project and quality product. The LP-100A is working very well in my station. Take a look at the attached photo. You can use the photo in your site if you want. Thank you so much and congratulations for the excellent equipment. I am so happy!! !